It's June, and oh yes my friends that means summer is here. Quick, get out your summer nail polishes before it starts to rain again! 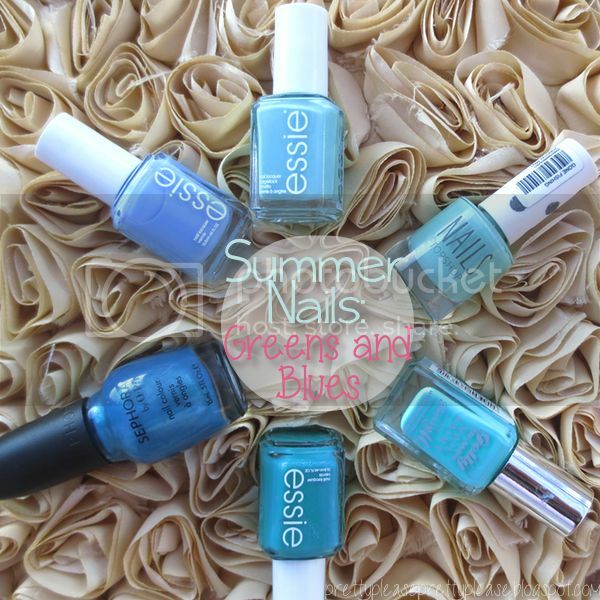 I've put together a collection of polishes that I think are perfect for the summer months. I've tried to pick colours that will suit a range of skintones - think deep sea blues and minty greens. 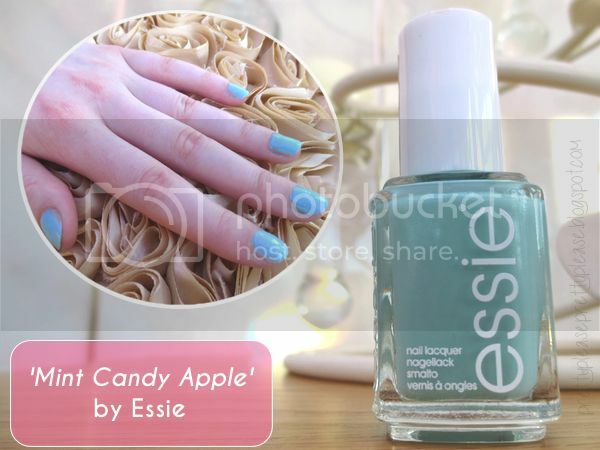 Mint Candy Apple by Essie - Have I not raved about this colour enough? Pastels look beautiful on tanned skin, especially when they're greeny blues and this is the perfect balance between the two. 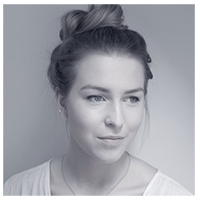 It's also pale enough to suit fairer skin tones (tried and tested by yours truly). Unlike most pastel nail polishes, however, this one doesn't appear patchy and when it'sapplied well, plus it's opaque after only one coat. Although I'm pretty sure I have the old formula it is easy to apply smoothly. 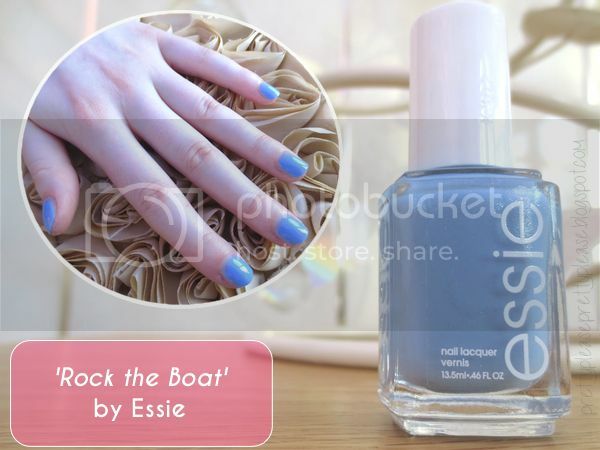 Rock the Boat by Essie - This is a fairly new addition to my collection. It has the smooth and even product formula that I love about Essie polishes and take two layers to become opaque. I'd describe the colour as a pale cornflour blue with a very slight lilac tinge to it. It has some shimmer in it which adds a lovely sheen. This colour is the only one of this selection that slightly steps outside of the bluish-green spectrum, but I think that it would be so perfect for evenings out when you're on holiday. Gone Fishing by Topshop - This was my very first blue-green polish that I bought. This shade sits perfectly inbetween Mint Candy Apple and Greenberry. The formula of this one has to be my least favourite of the bunch - I've had it for a year now and it is already gloopy and difficult to apply evenly (I find that this happens with my other Topshop nail polish too). The colour, however, is undeniably lovely - I love how fresh it looks. For £5 this would be a great addition to anyone's green/blue nail polish collection. Greenberry by Barry M - Have you not heard me rave about this already? Oh, well this is Greenberry by Barry M (you can read about it in my May Favourites post here). This colour is absolutely gorgeous: really bright and glossy as well as perfect for all skin tones, even on toes! This only costs £3.99 and is so easy to apply evenly. It's opaque after just one coat and won't start to chip straight away when you don't use a topcoat either! Naughty Nautical by Essie - Another new addition to my collection, this slightly dark green colour would be perfect for deeper skin tones. Don't let that stop you if you're a little paler though, it has a little bit of shimmer in it which adds a bit of a glow in the sunlight. It really looks surprisingly bright on your nails, plus it would be the perfect autumn transition colour. Two coats of this easy application formula and you're good to go! Skinny Jeans by Sephora by OPI - This deep, shimmery shade of blue was my absolute favourite when I was younger. I went off of it for a few years but it's back in my good books once more. This is one of those colours which almost changes colour when the light hits it and brings out it's green tones. This is a really versatile colour which I could picture being ideal for lazy days by the pool. What are your favourite blue and green polishes? I've been wanting the Gelly Greenberry for ages! I also love the Topshop polish! Love naughty nautical by essie! And the topshop one is really nice too. I just think blue in general is such a pretty colour for nail polish especially the brighter once at summer! I love all of these! For the longest time I've been trying to find mint candy apple because it's been sold out but I finally found a pretty close match with Maybelline's green with envy. These are great shades though! essie mint candy apple is one of my faves! LOVE Mint Candy Apple, been eyeing it for a while.